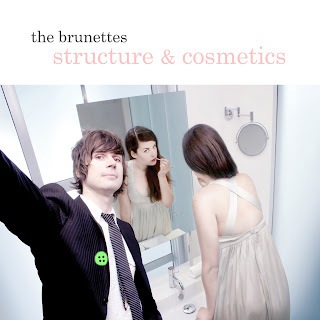 It was 2007, and it was the dawning of the release of The Brunettes third album 'Structure & Cosmetics'. As you may well know this album was their first release on the big fancy overseas label 'Subpop' records. As a result, many in the art, fashion and funding sectors in New Zealand finally began to take the band seriously - because they were now super important and extremely famous and also they were friends with Nirvana. Somehow however, Jonathan Bree was still broke and homeless. He didn't even own any clothes - he just wore reviews of his previous albums that he had cut out of the newspapers and cellotaped (sticky taped) together to form some kind of poncho. His one dream was to own a fitted suit. With 3 buttons. And with his fame skyrocketing he thought that now could be his his only chance to swindle one. A deal was struck with a local high end high street tailor. High times. They would make him the suit of his dreams - in return for him wearing it on the cover of their new album. He could have whatever type of suit he wanted, providing it was whatever type of suit they wanted. Unfortunately an awkard exchange occurred between the owner of this high end menswear store when Jonathan made his one request for his new suit. He requested that the suit have not 2, but 3 buttons. The owner of the store insisted that surely Jonathan did not want 3 buttons and tried to use his jedi mind tricks to purge that extra button from his mind. But Jonathan did not back down. He said he wanted 3 buttons because he wanted to look like Mark Ronson because Mark Ronson is a trendy British producer who wears 3 button suits all the time and looks like a real mod and he always gets money and ladies thrown at him and he is really popular and stuff and he gets invited to all the cool parties. The suit eventually arrived and a message was sent to the Brunettes manager saying that this would be where the relationship between the 2 parties ended. This was because Jonathan Bree was the rudest and most difficult customer they had ever encountered. Jonathan tried on the suit and it fitted beautifully. It was an impeccably designed and made suit, and it only had two buttons. Best story ever. Chelsea, can we please get married?